(above) “Team Union” will continue the tradition of participating in the Lincoln Tunnel Challenge 5K this year. 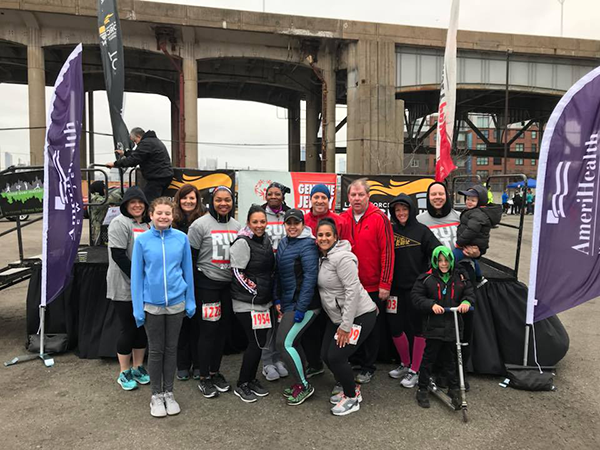 Union invites its residents to join “Team Union” as they participate in the 2019 Lincoln Tunnel Challenge 5K to benefit the New Jersey Special Olympics and the 25,000 athletes that they serve. The race will be taking place on Sunday, April 28, 2019 from 8:00 to 10:30 a.m.
“This is going to be a great opportunity for the Township and its residents to come together and raise money that will benefit the New Jersey Special Olympics. This is our second time participating in the 5K and last year, we all were able to share this momentous time together. I encourage everyone to participate and join us for this special event,” said Mayor, Michele Delisfort. The Lincoln Tunnel Challenge 5K is the most unique race in the country because not only is it underwater, but it spans two states. Participants will begin and end at the toll booths in Weehawken, NJ. There will be a cone turnaround once the participants reach the NYC side of the tunnel. There is a $40 registration fee for those who register by April 21 and a $50 registration fee for those who register after or on the day of the race. To receive the t-shirt and race bib by mail, participants can pay a $50 registration fee online. Registration and check in begins at 6:00 a.m.The first race begins 8:00 a.m. for those who run 30 minutes or under and the second race begins at 8:45 a.m. for runners and walkers over 30 minutes. To participate and join Team Union, please visit classy.org/team/215824. If you have any further questions please visit Uniontownship.com, or call 908-851-5096. To keep up to date with all things the Township of Union follow them on social media @twpunionnj.